Expedia determined that the best time to buy flights for Thanksgiving is now through October 22. It’s only the beginning of October, but Thanksgiving and then Christmas will be here before we know it. Now is the time to make a move on booking domestic flight reservations. Every year, travel industry experts identify an optimal window for buying holiday airfare. When exactly is that window this year? And while booking a flight during this window may score us some savings, the financial hit still tends to be substantial. What are some ways to cut costs on holiday air bookings? Here's what you need to know to get a jump on holiday travel. Don't wait until Cyber Monday, Expedia determined that the best time to buy flights for Thanksgiving is now through October 22. For Christmas, prime buying time falls later — between October 27 through December 4. What has always struck me as confusing about these optimal flight buying windows, is that they suggest that buying earlier than say, October 28 for Christmas travel means you’re getting a less compelling deal than you would if you’d waited. But isn’t buying early always the shrewdest move when you want to save? The answer is ambiguous, in that it really just depends. You might land a cheaper deal today than you would the end of the month, but you could also get a cheaper deal if you waited. It’s actually more accurate to look at these prime buying windows not as the hands-down best times of year to buy holiday airfare, but as the last string of dates where you will pay a competitive price, and maybe stumble on a steal. In its Holiday Travel Index 2018, Hopper found that domestic flight prices for Thanksgiving round-trip fares are currently going for around $288, Hopper’s report notes — actually down from what you would have paid in August, on average, by $100. But again, it depends. For instance, the ticket prices I’m seeing for Los Angeles to New York City flights for Thanksgiving are generally higher now than they were in August. The cheapest day to leave, based on this data, is Thanksgiving Day, November 22, and the best time to return is Wednesday, November 28. Also consider that the cheapest day to leave, based on this data, is Thanksgiving Day, November 22, and the best time to return is Wednesday, November 28. The next cheapest day to depart is Monday, November 19. So, these fair prices rest on your ability to be very flexible, and possibly even to be okay with spending Thanksgiving dinner on a plane. Christmas round-trip air is currently averaging $320 round-trip, and you can save the most money by departing on Tuesday, December 18 and returning Thursday, January 4, according to Hopper’s findings. Now for how to curb these pricy purchases with some money saving hacks. 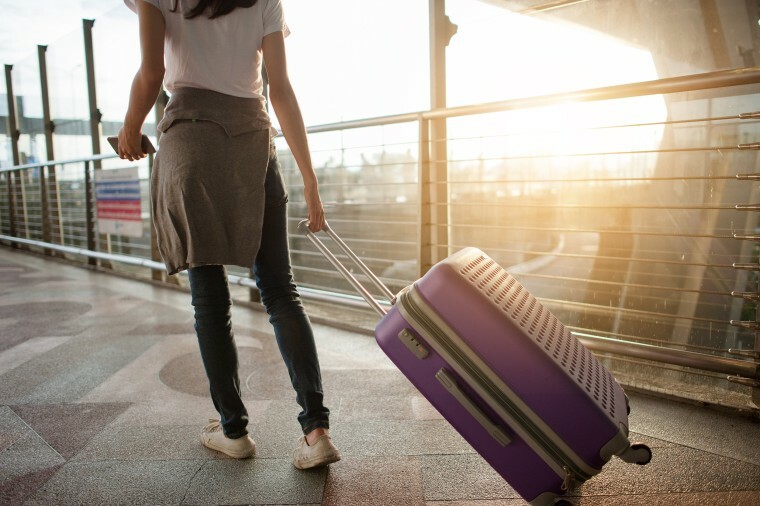 If you’re up for opening a new line of credit and don’t have a travel rewards card (or want to add another), you should apply for one to start accumulating travel points quickly. Flying during the week is almost always cheaper than leaving on the weekend. The holidays only emphasize this rule. Expedia’s Price notes that red eyes and flights with layovers also tend to be less expensive. A simple way to save some cash is to use a browser extension app that automatically searches for coupon codes online. You should also use a cashback extension like eBates, TopCashback and RetailMeNot for a small reimbursement later. I’m looking at Expedia.com right now with my eBates plug-in and seeing I can get up to 10 percent cashback on my travel purchase. I have used this cashback method often, with success, receiving a personal check for the reimbursement amount within a few months. Cashback percentages do tend to vary by the day, and coupon codes expire quickly, so I recommend biting when the offering is hot, and 10 percent is on the higher side. One travel hack you likely won't hear much about comes from Kevin Huhn, a frequent flyer and business growth strategist. "Book online at the best possible rate, then immediately after (within a couple of hours), call the source you used to book and ask them if there is a better rate." Eager to gain your loyalty, customer service might do a bit of extra searching to find you a better deal, or offer you a bonus. Kuhn recommends doing this again before boarding.